Recognized as being among the first to make needle bearing headsets, this is one of the finest and lightest versions we have seen. It starts very similarly to other needle bearing units. There are six aluminum pieces. Five of them are cast and cleaned up by interior machine polishing. These are the cone race elements, the bearing cup elements and the head lock nut. The head key washer is stamped from sheet aluminum. There are four beveled steel races, one for each of the cup and crown elements. The needle bearing retainer has twenty bearings in it. Although this headset has no rubber seals or skirt gaskets, with the tolerances that the parts are machined to, it probably doesn't need it. With the parts just resting on one another, and with no grease, the pieces move very freely. Available in English thread in Silver or Black. The A- 9 weighs 79.5 grams. The Delta is the A-9 enhanced with an O-ring seal around the perimeter of the fork crown race, and another within a groove around the perimeter of the cone race that is pressed into the top of the head tube. Like the A-9 the Delta is available in only a 1" diameter, in either Black or Silver with English threads. The Delta weighs 86 grams. The X12 uses the same needle bearing system as the A9, but the X12 incorporates an overbuilt headlock nut/bearing cup. 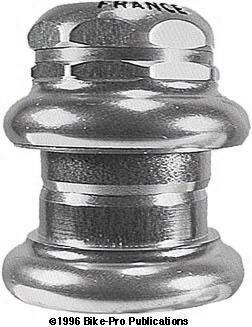 The upper bearing cup and head lock nut are cast as one massive piece of aluminum. It's then threaded for the fork and cut twice on the top to make the grips for a headset wrench. Another cut is made two- thirds down the face to provide the contraction area that cinches on the steer tube. The final stage on the piece is drilling and tapping for the bolt. The X12 has a stem seal to prevent dirt getting in from the top. 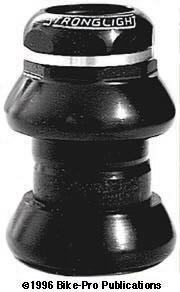 The fork crown race, upper cone race, and lower bearing cup are made of cast aluminum. The beveled needle bearing races are made of stamped steel and lie onto the adjoining cast aluminum part. The X12 weighs 134 grams and has approximately a 37mm stack height. Available in Silver or Black, only in the 1 inch size. This is an extremely sturdy headset. The X14 is very similar to the X12. The entire lower assembly is the same except the fork crown race lacks the groove that holds the lower O-ring dirt seal. Other than that change, the lower assembly uses the same races, bearings, and cup. The upper assembly uses the same bearings and races found in the X12, and is also used in the lower assembly. The upper piece that fits into the head tube holds the steel cup race. 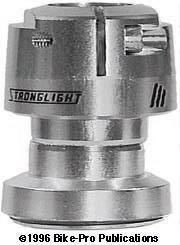 This piece is forged of aluminum alloy with a groove around the perimeter into which is an O-ring making a dirt seal. The primary difference between the X12 & X14 headsets is the shape of the upper head piece. 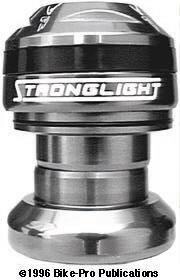 Above we mentioned that the headlock/headnut was "overbuilt", and it seems that Stronglight thought so as well. 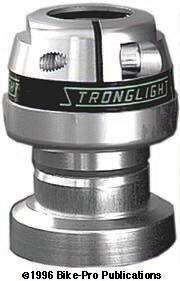 The X14 headlock/headnut functions like the X12 but has an added horizontal cut 1/2 way through the piece that separates, and frees to operate independently, the two upper clamping arms. This horizontal cut is kept from view by a piece of Black tape with the Stronglight logo. The headpiece is slightly smaller and somewhat lighter at 53.5 grams rather than the X12's 66 grams. The X14 is made only with English threads, in the 1" diameter with a Black or Silver anodized finish. It weighs 117.5 grams.